EIFS stands for “Exterior Insulation Finish System” It is a product which uses plasticizers, additives that increase the plasticity or fluidity of a material, to modify Traditional Cement Stucco and make it more flexible. This allows applications in a thinner coating which saves time and material. The system also includes an insulation layer that increase and upgrade system and building performances. Eifs reduces heating bills in two ways, by reducing air infiltration into your walls, and by reducing heating transferred through walls by adding insulation to their exterior. Another great benefit of synthetic stucco is its allure, from basic EIFS with flat trim, columns, pilasters, keystones, flowers, and elaborated molding. You can find a wide range of textures, colors and design options. You should consider EIFS stucco to get a new look for you house or project that will protect your patrimony. Usually, the average stucco construction renovation will take about 3 to 4 weeks, depending on the size of the project. Homeowners should start looking for quotes at least two months in advance, especially here in New England. The EIFS stucco construction season can end in the latest of November, or before temperatures drop below 40 Fahrenheit. 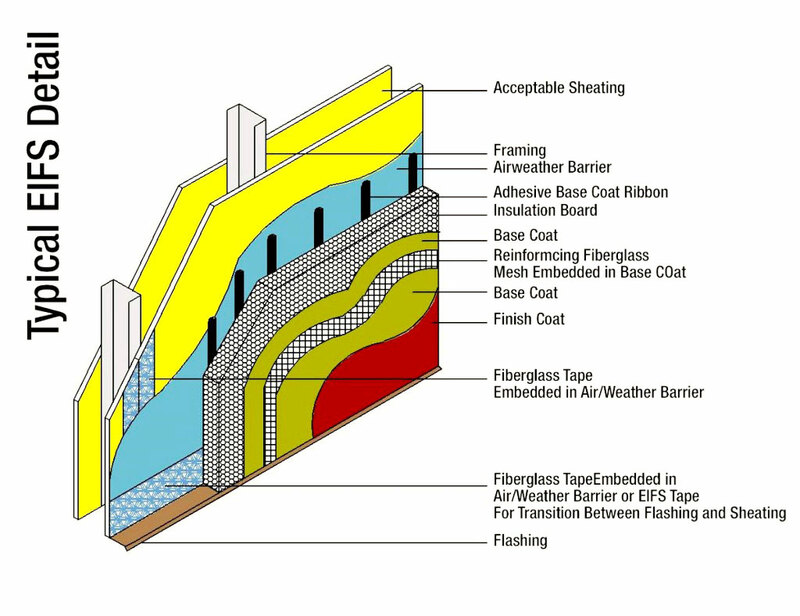 To install Air and Moisture Barriers and EIFS, the performance will consist into several steps. The air moisture barrier will include the Cementitious Adhesive, the insulation board and the base coat (either Cementitious, non-cementitious or waterproofing) the Standard Mesh, the Primer and last but not least the Finish Coat. Jhonatas Construction uses the best product on the market for material and installation of Air & Moisture Barrier, and EIF System. STO products are intended for use by qualified design professional Contractors. The EIFS installed by our company is in accordance with the specifications and STO’s instructions. Working with a reliable construction company specialized in E.I.F.S stucco will help you come up with ideas and how to invigorate things as you can count on our experience and expertise. Building your projects or simply renovating them is an important decision, so is hiring an experienced contractor that will help you save time and money on the long run. This was some information on E.I.F.S stucco so you could get a basic knowledge that you will need to discuss price quotes, contracts and future maintenance costs.